I often wonder if I am the only person who wakes up on a morning, looks about the house and despite vowing to spend the day relaxing actually ends up running about like a nut trying to make some sense from the chaos. I don’t feel relaxed if something is niggling at me and the last few days that niggle came in the form of our dining room chairs. 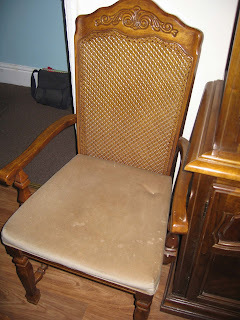 I should probably start by saying I have never really liked these chairs, they’re large, they have the most grusome colour of stained dralon adorning their seats and the children like to spill things on them at regular intervals and they were passed to us by a family member whose tastes has never really meshed with mine. Suffice to say I have often wished to change them (ah hem… tip them!). They are based on an antique design, but they are decidely mordern (80s). Motivation finally came in the form of my husband who thought he would use one of the chairs instead of a step ladder. Several seconds and a nasty crash later and the seat was no more. It’s hard to see the carnage on this pic, but trust me you would not want to rest any weight on here. Taking apart and reupholstering fairly modern chairs is usually quite easy. This chair merely had 4 screws in the underside of the seat. 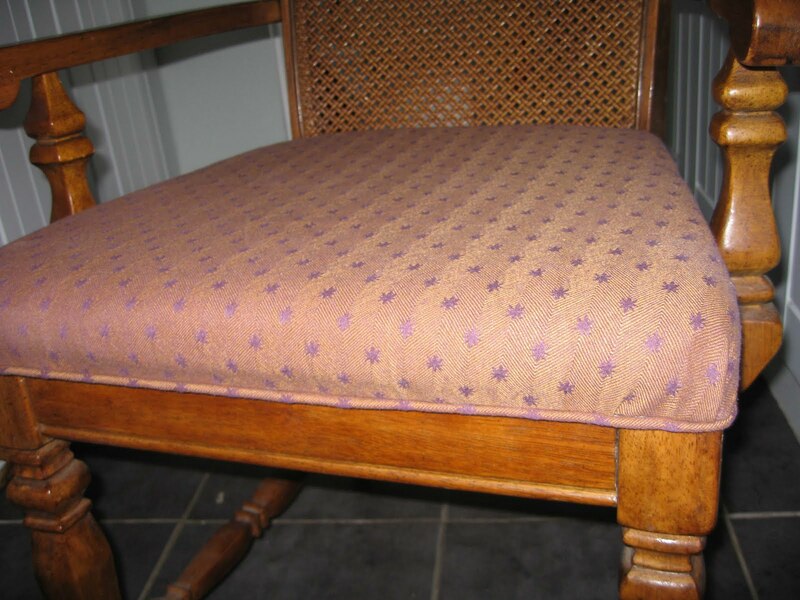 We used a screwdriver to unpick the staples holding the fabric and piping on and hey presto an uncovered chair. The inside just consisted of a board base and a sponge pad for the seat. To replace the cracked base piece my husband jigsawed a copy out of a shelf from an old computer table (more recycling and economising). The sponge padding was in good condition so I reused that. I then unpicked the piping to reuse the rubber to make new piping. Recovering this chair was really easy. 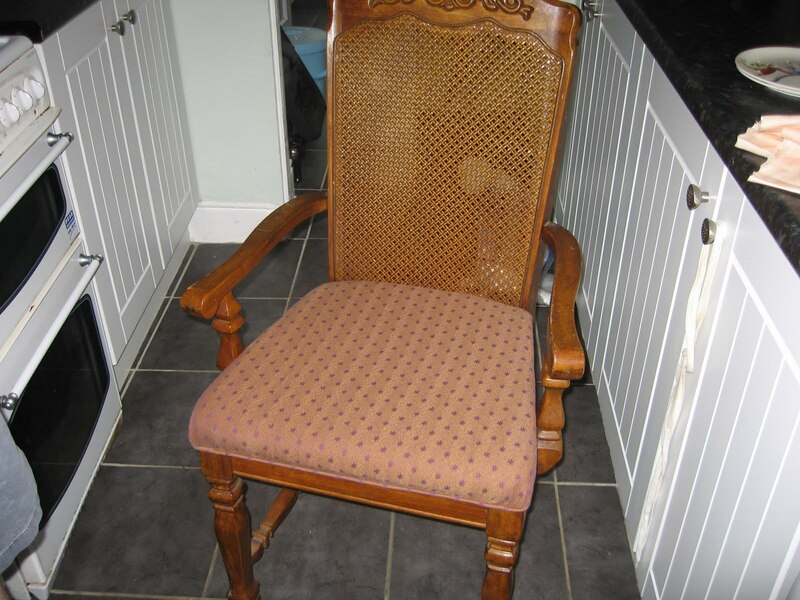 In my cupboard I had loads of an old Laura Ashley fabric, it had already served as a sofa throw, table cloth and now would revive my dining chairs. Next all that was required was a good quality staple gun. These are not expensive, usually around the £5-7 mark. All I had to do was stretch the fabric over the sponge pad and staple to the underside of the seat board. For the corners a quick fold is all that’s needed. To really add a bit of elegance some finishing touches are usually required. I had already sewn new piping out of matching fabric. I could have spent hours painstakngly sewing this onto the seat, but instead I lined it up and stapled away. The end result is very convincing and quick and easy. If like me you have little peeps running about armed with felt tips, drinks, sticky fingers covered in plastercine, food or the remnemts from their lunchbox then you will understand the need to protect your new upholstery. This couldn’t be more easy, just nip to your local fabric shop and buy some clear pvc fabric, I bought mine from Dunelm Mill. Cut a piece big enough to stretch over your seat, fold the edges and staple the whole lot over the top. You are left with a completely covered and protected seat, but you can still enjoy the look of your new chairs without the worry. I am so pleased with the final result, I toyed with the idea of painting the chairs, but I’m glad I didn’t now as I think it looks quite grand without it. So the chairs and I have at last made friends. All 6 were completed in a couple of days, so if you have any chairs you’ve fallen out of love with give reupholstering a go, it’s really not as hard as it looks. This entry was posted in Tutorials, upcycling and tagged chair, piping, re-upholster, re-use, recycyling, staples, tutorial, upcycle, upholstery. Bookmark the permalink. 2 Responses to The Itch to (Re)Create! That's fantastic Abi! I'm planning on sanding and painting our horrible Ikea dining chairs, and making new seatpads. 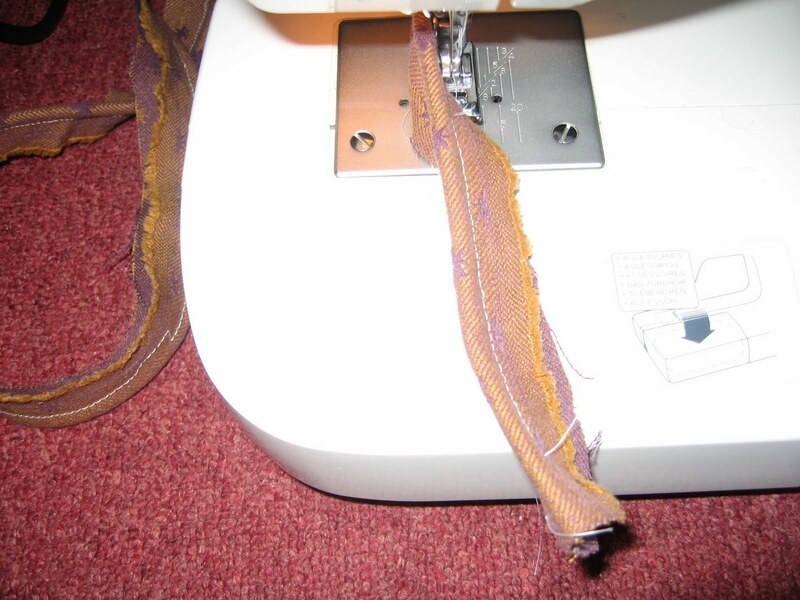 Although we can't even eat at the dining table as my sewing machine seems to be permanently attached to it… ooops! Thanks, you should definitely do your chairs too. It's really satisfying and a lot easier than you'd think. Plus lots lots cheaper than paying someone else to do it or new chairs. Are you going to strip the chairs back? If so there's a great product called Homestrip, doesn't have fumes so much safer.